Living room with flat screen tv and doors leading to the patio. Back patio w/ seating for 8 with a Weber gas grill. 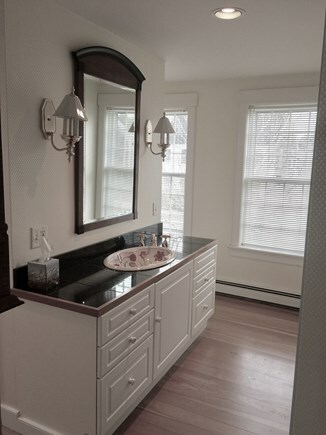 Our beautiful and newly renovated 4 bedroom Colonial home is centrally located on Goldfinch Drive in Naushop Village. This is a private and peaceful, family-friendly neighborhood, offering easy access to both town and the south shore beaches. 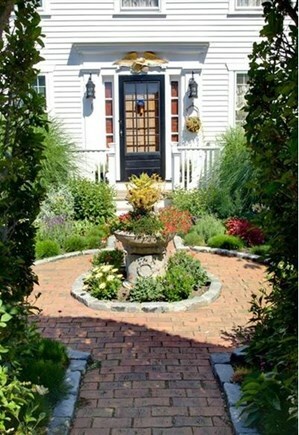 Naushop is a quintessential Nantucket community village, featuring traditional shingle-style homes, white picket fences, brick walkways, historical lamps, landscaped lawns and flowering arbors. 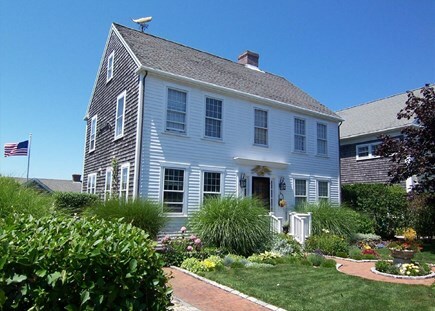 The character of the village is very much in keeping with Nantucket’s old historic charm. You will have complete access to use the exclusive community clubhouse, heated swimming pool, children’s pool, tennis courts, shuffleboard and playground and park area for children. 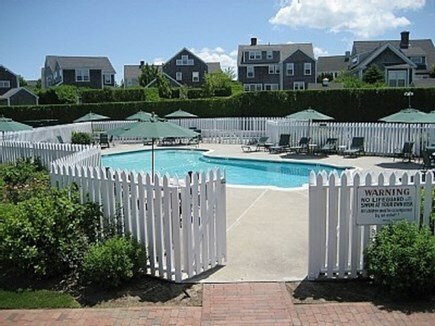 These upscale amenities are extremely well maintained and located within a short walk from our home. Nantucket’s NRTA Shuttle bus stop is also located right around the corner from us at the entrance of Naushop, offering regular transportation to and from town, and to all parts of the island. 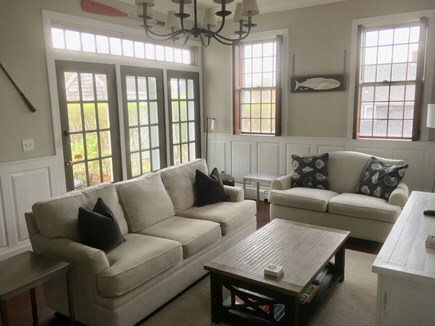 Our home is less than two miles from the pristine, sandy South Shore beaches of Surfside and Nobadeer, and easily reachable along the bike path, which also abuts Naushop Village. 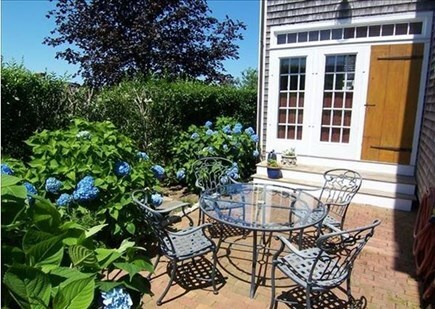 The beautiful state forest is a short walk from our home, and Nantucket’s historic downtown is only 2 miles and a quick 5 minutes away on the shuttle bus. You have the option to leave your car at home! Naushop is the ideal location. 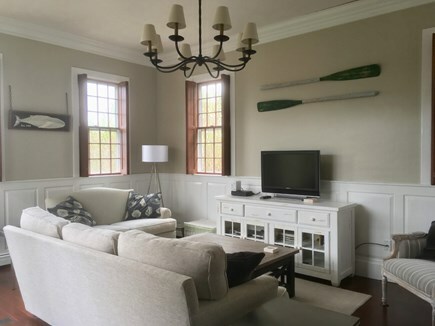 Relax and enjoy the comfort of our recently renovated and freshly painted country-style home, featuring new furniture throughout. 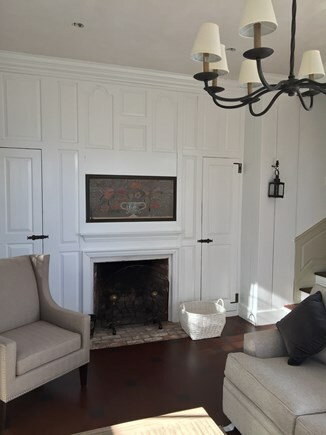 On the first floor relax in our great room, which has high ceilings, cherry floors, fireplace and a flat screen television. High speed Wifi access is available throughout the house as well as on our patio. French doors lead out to a beautifully landscaped, private yard and brick patio, with wrought iron table, chairs and a gas grill. 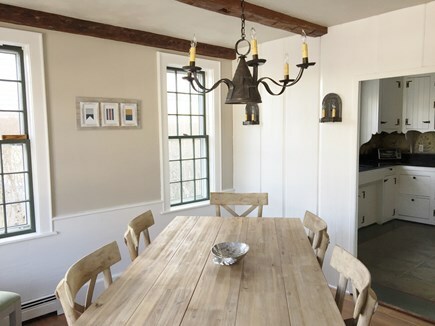 The fully equipped kitchen features soapstone countertops, Viking stove, custom wood cabinets with forged iron hardware and wood beams that extend into the dining room, with rustic table that comfortably seats 8. 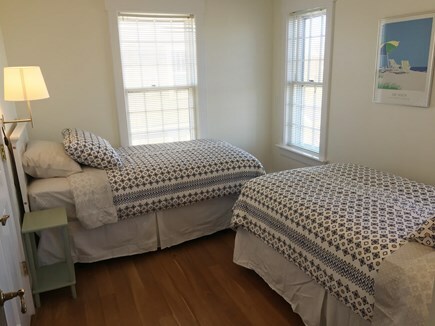 Three bedrooms are located on the second floor with a fourth bedroom on the first floor. 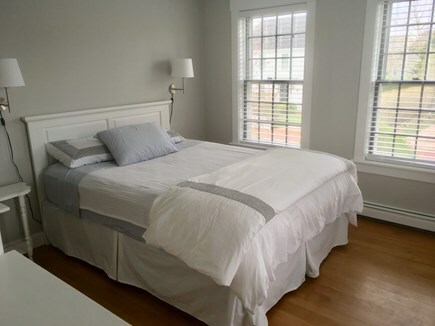 The large master bedroom with tray ceilings has a comfortable king-size bed and large, well-suited master bathroom. 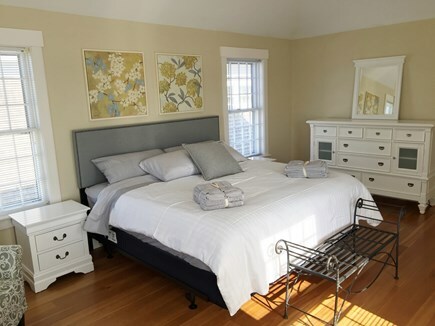 The bright and cheerful second bedroom has a queen-size bed and our third upstairs bedroom offers two twin beds. Both these rooms share a full bathroom. 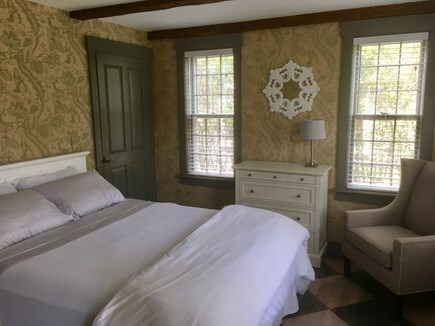 The fourth bedroom is located downstairs with a queen bed and charming wood beams on the ceiling. Pristine and absolutely charming; the resources that are on our doorstep will enhance your stay in our beautiful home. Additional pricing info: Cleaning fee $325; Refundable Security Deposit $500, State and local taxes of 11.7% will apply. First floor bedroom with half bath on the first floor. Outdoor shower, off the patio, is available if stairs are difficult. My husband and I are excited to share our home with you. I have spent my summers on Nantucket since I was a little girl. This is truly a special place for me and my family. We have two boys and we try to spend time on Nantucket each summer. We have a passion for travel and love to discover and explore new places. Our love for Nantucket, with its gorgeous beaches and charming historic town, somehow always brings us back :-) We look forward to welcoming you to the island and helping you in any way possible. 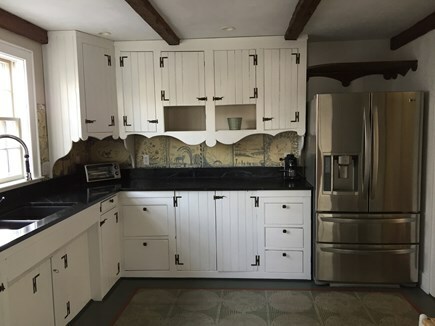 We chose this property as it is centrally located and close to some of our favorite spots on the island. The house is in the wonderful family-friendly community of Naushop which includes access to a fabulous clubhouse, pool, tennis courts and playground for children. We love that we can hop right on the NRTA Shuttle which is a short two minute walk from our house, and travel to all points on the island. It is perfect for our boys who love the independence of shuttling into town which is a five minute ride. We are right by the bike path and we always look forward to exploring the island by bike. We can even walk to the South Shore beaches which are less than two miles away (or take a leisurely jog).